Pio Big Bazar selects popular Japanese foods and ships an original assortment. Freeze-dried Miso and some ingredients in 1 pack. Eggplant miso soup with Fried tofu, Wakame seaweed.5 meals. Nameko mushroom miso soup with Japanese leek. 5 meals. 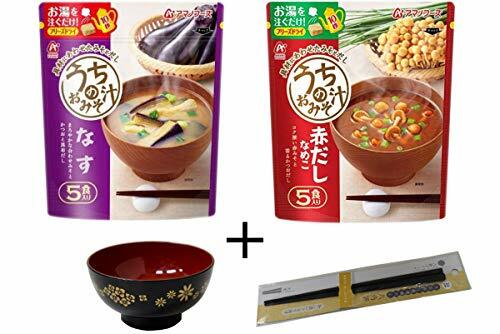 You can eat just to pour hot water.Please eat with good Japanese soup bowl & chopsticks. Sorry, as for the choice of soup bowl and chopsticks, leave it to me. View More In Miso Soups.